(APN) ATLANTA — Atlanta City Councilwoman Joyce Sheperd (District 12) urged seniors to stay in their homes and not to sell their homes at a Homeowner Empowerment Workshop at the Arthur Langford Jr. Recreation Center in Southwest Atlanta. Councilwoman Sheperd said she receives offers in the mail almost daily to purchase her home with cash. Sheperd owns her home, located only one block from the Atlanta Beltline. “This is a very important workshop for me. Developers come into our communities… [saying] ‘There’s gold in them there hills,’” Sheperd said. “What developers see is, my God, this side of the city is getting ready to develop,” Sheperd said. “People will call you and say your house is forty thousand dollars, fifty thousand dollars, sixty thousand dollars; and they’re saying they’ll buy your house today, we’ll close in two weeks, and just sell ‘em your house,” Sheperd said. “I’ve got a stack of letters that I keep,” she said. Atlanta Progressive News asked the audience members whether they were also receiving those types of mailers, and nearly the whole audience of forty people raised their hands. But Sheperd said she believes many homes are currently under-valued by Fulton County. “They’re getting ready to begin to look at right now, our housing costs in my community. We are actually under cost in terms of our housing value. If you look at Fulton County tax assessors, my house is valued at $74,000,” Sheperd said. “It’s almost like a redlining thing on the south side of Atlanta,” she said. But property values are on their way back up. “It’s getting ready to start. Our city is out of recession. We want to make sure there’s a good balance – good stores, good restaurants, we want all those beautiful things we have on the northside of Atlanta, [also] on the southside of Atlanta,” Sheperd said. “That is, rich folks and investors and carpetbaggers, know this community is going to change,” Sheperd said. “What they’re banking on, is, you don’t know the value of your house. They think you’re struggling like a dog to make payments on your house. Seniors who are struggling, they don’t know any better,” Sheperd said. “Y’all heard this term gentrification? Newcomers are coming into your area, older residents are going to be pushed into the suburbs. As you said, sixty thousand dollars doesn’t cut it. What’s happening in Atlanta is happening everywhere,” Sheperd said. “Oftentimes a developer can be a corporation. They can in this country or out of this country. Or it could be a mom and pop,” Tia McCoy of Habitat for Humanity told the residents. “They [may] want to add it to their portfolio of properties. They add it for various reasons. They bought property and they’re sitting on it, so they can turn around and sell it for a lot more. They may want to do something called AirBNB,” McCoy said. “Oftentimes investors bank on that, offer a little bit of money,” McCoy said. McCoy recommended that homeowners, if they desire to sell their home, that they consider a variety of criteria, including proximity to the Beltline and whether the home value will likely rise in value. Also, homeowners should look at the last six months of sale prices within the square block. “Don’t get upset ‘cause you get a letter. Don’t get upset when they knocking on your door. Just say no thank you, keep calm, and keep it moving,” McCoy said. McCoy also said that seniors should consider whether they have a plan for where they’re going if they do sell their home. McCoy said that the likelihood of finding a new house in the City of Atlanta that would be affordable to purchase at the rate at which a senior would sell their current house, is slim to none. In order to rent, someone needs verifiable income and good credit. If a senior were to live on the money from the sale of their home to pay their rent and living expenses, that money will likely run out in short time. If a senior has an “underwater” home, which means the mortgage amount is greater than the current value of the home, they should consider asking the bank for a refinance, a modification, or a short sale. Another major concern is property taxes, which are set to go up when property values go up. 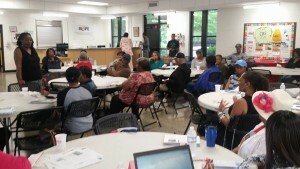 McCoy said that a lot of seniors in Fulton County are unaware that they could qualify for a Fulton County Tax Exemption. There is a basic exemption, a senior exemption, an exemption for disabled people, and an exemption for the surviving spouse of a deceased veteran. Currently, there is an Anti-Displacement Tax Fund available for homeowners in English Avenue, Vine City, Ashview Heights, and Atlanta University Center neighborhoods, that is funded by private philanthropy. The deadline for the Anti-Displacement Tax Fund applications have been extended to May 15, 2018. But Sheperd said a lot of homeowners have learned they are disqualified because they don’t have homeowners’ insurance or because their home is in disrepair. Councilwoman Sheperd and other city officials are currently looking at ways to expand the Anti-Displacement Tax Fund or find other ways to provide property tax relief to other neighborhoods in Atlanta. Matt, you are doing a good service publishing articles like this one. Keep it coming. The vultures are dripping blood! Carpetbaggers! Trumpers! They need to be followed as they approach each unsuspecting homeowner’s door and told to scram! progressive or green investing such as the ads in Mother Jones or the Progressive magazine. This is a great article. I get these papers all the time asking me to sell my house. I simply put the papers in the fireplace until I fire them up. I have worked too long and hard to pay for this house and not about to let someone have it. Thanks for this article. If the powers that be would work with investors and developers to correct some of the blighted areas left behind in the last recession, the neighborhoods would bounce back. Little old ladies and long term families can stay in their homes while the blighted homes and neighborhoods get built back up. It makes no sense that dilapidated properties that have trees growing in the middle of them have old water, sanitation and tax liens against them for years can’t get bought up and sold much more rapidly then they do. Even though the city is all abuzz about the Beltine the Westside Park and other great things going on in the city, there are a whole swath of properties and areas that are being ignored because the city won’t let go of their grasp on the torn up area that are abated. Roll those taxes into the sales price or forward cast the back taxes and let those bad properties trade on the market. The city would get their money back and developers and builders can do what they do best and develop and re-build blighted and ignored areas. It can’t be that difficult to find these people who abandon their properties. If bill collectors can find you, the City of Atlanta should be able to as well. Surely APN realizes that Sheperd (instead of being a shepherd) largely voted for measures brought forth by the last administration….